This is an excellent portal into one of history’s most inventive and pioneering minds. I’ve thoroughly enjoyed this book and learned some insightful things along the way. Elon’s story is nothing short of amazing, and his persistance to literally help save our species is quite remarkable. 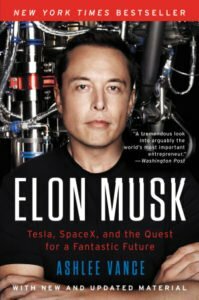 If you’re a fan and have curiosities of your own about the thought process of this genius, or his vision for our future, I highly recommend reading this.